We are thrilled to introduce our new Kids Land WordPress template. Because the same Design in Joomla (which can be viewed here https://gridgum.com/themes/kids-land-kindergarten-joomla-theme/) was so popular among customers, we have decided to make a WordPress version. What makes this specific template perfect for your pre-school or kids studio business? The answer is long but simple. Firstly, it has an amazing colorful design, with the main menu pages for Home, About, Services, Gallery, For parents and Contact us. The homepage has a beautiful slideshow and has JS carousel with basic information about the classes, groups, teachers and social events. “About” has a place you can write about a little bit of history behind the pre-school and also list a few incentives under “Why Choose Us”. It also has a carousel of the staff and the whole team with pictures and their job descriptions. Every staff member also has a more detailed and thorough information about them available for the parents. Services page obviously displays a list of services offered by the kindergarten and their descriptions. There’s a nice photo gallery page where you can upload photos of kids having fun and learning, social events and frankly anything you would like. As parents are very picky about pre-schools Gridgum has created a section especially for them with any and every kind of detailed information about the establishment itself, the dates and times of parent-teacher conferences and celebrations. The last one is the contact page which has obvious contact information like e-mail, address, and phone number. It also has a Google map of the place to make locating it easier and a contact form to simplify communication from each visitor directly to you. As strange as it might sound the reasons listed above are not the only ones to make this template perfect for pre-school owners. What many of start-up businessmen fear is the lack of knowledge in coding believed to be necessary for having one's own website and the inability to customize and make the website exactly as desired. Lucky for you, this WordPress template is as easy to work with as Microsoft Word. It does not require literally any extra knowledge of coding for management. With the help of these plugins, you can improve your website, like make a so-called SEO, which stands for Search Engine Optimization- a process, which affects the visibility of the website's information by search engines. Should you have any questions regarding this Kindergarten template, please do not hesitate to contact us or leave your question in the COMMENTS section above. We will answer any questions you might have with special step-by-step video tutorials shortly after. With the purchase of this template, you get a full Life Support an unlimited amount of video tutorial answers for every question about any process regarding this template. 1. HOW TO CREATE MySQL BASE WITH USER ? 2. 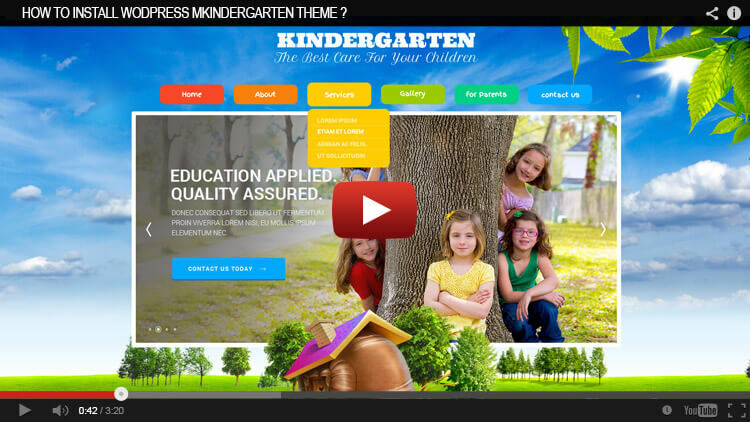 HOW TO INSTALL WORDPRESS & KINDERGARTEN THEME ON IT ? Well, looks like my comment removed again. :| That's annoying!!! If you say on information page that you address all questions in comments you should keep your promise. Hi George, the picture you sent displays 'pending'. Are you sure it means transaction didn't get through? thank you for payment, please let us know if you need any further information or help from us. I was trying to buy the theme and at the end of process I saw green bar saying transaction was successful. But I don't see any download link. What should I do? Hi George, Please upload a good video on how to upload the sql database to get the content. Its not properly visible even on 1440p video. The video gets blurred. Thank you. Is this compatible with newer versions of wordpress? Where are any settings in this template ?